From left, Union County Public Safety Director Andrew Moran, Union County Prosecutor’s Office acting Chief of Detectives John G. McCabe, Jr., Springfield Police Chief and Union County Police Chiefs Association First Vice President John Cook, Union County Sheriff Joseph P. Cryan, Atlantic Health System Director of Behavioral and Integrative Health Services Lori Ann Rizzuto, Trinitas Regional Medical Center Vice President of Psychiatry and Behavioral Health James McCreath, Ph.D., Robert Wood Johnson University Hospital Rahway Director of Clinical Services Terrence McCarthy, acting Union County Prosecutor Grace H. Park, Prevention Links Executive Director Pamela Capaci, Union County Board of Chosen Freeholders Chairman Bruce Bergen, and Elizabeth Police Department Capt. John Brennan appear outside the Ralph G. Froehlich Public Safety Building in Westfield to mark the public announcement of the Union County Opioid Response Initiative. All three major hospitals in Union County are partnering with local and County law enforcement as well as a Roselle-based nonprofit group in an effort to help drug overdose victims break the cycle of addiction, according to a joint announcement made Monday by acting Union County Prosecutor Grace H. Park, Union County Sheriff Joseph Cryan, Union County Board of Chosen Freeholders Chairman Bruce Bergen, Union County Police Chiefs Association President and Rahway Police Chief John Rodger, Prevention Links Executive Director Pamela Capaci, Trinitas Regional Medical Center Vice President of Psychiatry and Behavioral Health James McCreath, Ph.D., Robert Wood Johnson University Hospital Rahway Director of Clinical Services Terrence McCarthy, and Atlantic Health System (Overlook Medical Center) Director of Behavioral and Integrative Health Services Lori Ann Rizzuto. Through a series of collaborative meetings held during the last year, the Union County Opioid Response Initiative was conceived and launched in order to improve the quality of services offered to individuals suffering from drug addiction, increase accessibility to community-level addiction resources, and streamline the fashion in which individuals are either brought to or seek help at inpatient and outpatient facilities across the area. 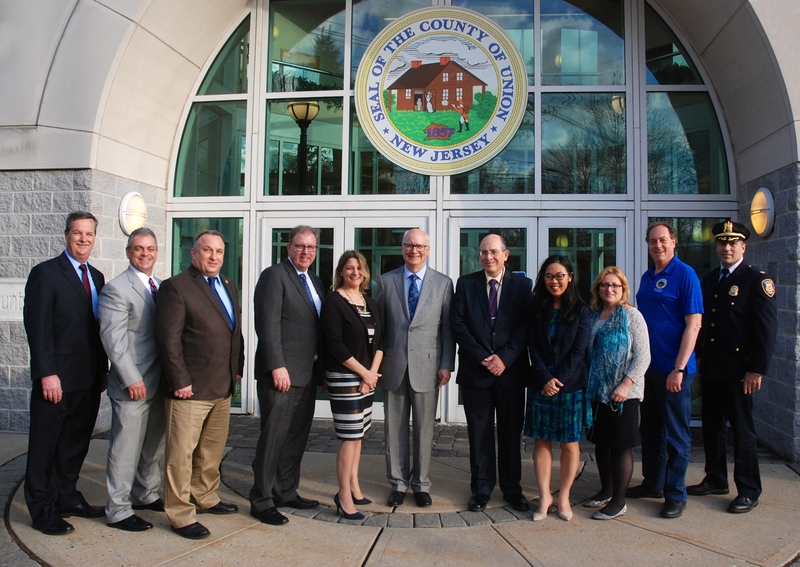 This marked the continuation of a partnership that also resulted in a November 2016 announcement that Trinitas, in Elizabeth, Robert Wood Johnson in Rahway, and Atlantic Health System, which includes Overlook Medical Center in Summit, had all signed memorandums of understanding with the Prosecutor’s Office pledging to provide new supplies of the lifesaving drug naloxone to Union County municipal police departments on a quarterly, on-demand basis. The Prosecutor’s Office had initially started distributing naloxone to those departments in July 2014, with individual deployments of the drug by police climbing from slightly more than 60 countywide in 2015 up to more than 150 in 2016. During that time, the Prosecutor’s Office and its partners agreed that more needed to be done to bridge the gap between simply saving lives and getting overdose victims the rehabilitative help they need. Therefore, the Initiative’s first major step, taken late last year, was to design and distribute to Union County municipal police departments a two-sided, laminated resource guide that today is provided to all recipients of police-administered naloxone. The guide features contact and background information for a wide range of local service providers offering treatment, counseling, rehabilitation, detox, and more. The Initiative progressed to result in Trinitas, Robert Wood Johnson, and Overlook each introducing its own program through which addiction recovery specialists meet with overdose victims on-site at the hospital. Trinitas funded its program at the start of the year and services will be available starting today, with one full-time and one part-time paid staff member with LCSW (Licensed Clinical Social Worker)/LCADC (Licensed Clinical Alcohol and Drug Counselor) certification assigned to the task. These staffers will be available as often as possible during high-volume hours in the Trinitas emergency room, including as much weekend coverage as the hospital’s budget allows, according to McCreath. Robert Wood Johnson in Rahway launched its program in October 2016, with its contracted addiction recovery specialists available on an on-call basis, 24-7, supplemented by certified emergency psychiatric emergency services staff and registered nurses. Its program is funded by a state grant. Overlook anticipates launching its program in May 2017, with volunteer addiction recovery specialists being trained directly through Prevention Links. All three hospitals have agreed to share their program data and outcomes with the Initiative in order to track effectiveness and tailor future efforts to meet specific needs of county residents battling addiction. Via quarterly usage reports, it is expected that the data collected also will be utilized by state and federal policymakers and researchers in order to inform future substance use policy and practice, Capaci added. A total of 249 people have died due to drug overdoses in Union County since 2011, including 52 in 2016. All but nine of those 52 victims died due to acute heroin intoxication, prescription opioid intoxication, or both. Those statistics mirror national trends. More than 50,000 Americans suffered a fatal overdose in 2015, according to the Centers for Disease Control and Prevention (CDC), with that cause now eclipsing auto accidents as the nation’s most common type of accidental death. The majority of drug overdose deaths nationally (more than six out of 10) involve some type of opioid. New Jersey was one of 19 states designated by the CDC as experiencing a statistically significant rise in its drug overdose death rate from 2014 to 2015, with an increase of 16.4 percent.